I want to thanks you for visiting the Dallas Bead Society this past February. 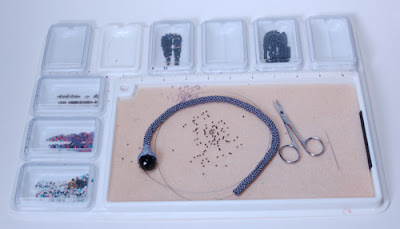 We appreciate all tips you gave us on how to organize our bead spaces on a more creative level. Artists and crafters are obviously visual people, but it was a new concept for me that our supplies are so inspirational/motivational, they should be out and seen at all times. After organizing my studio and implementing all the tips I learned, I somehow managed to lose the beads I was using for my Dragon Tears Lariat (pictured above, half finished), a class I took from Melanie Doerman. It just seemed so ironic. After I finished my Stars in Her Eyes Lariat, I decided to finally clean off my desk, and found my beads! So, I promise to use my organization system and my project cases more effectively from now on.